If you have any questions about the DULCINEA information page below please contact us. This motor yacht DULCINEA is a 34 m 110 (ft) well proportioned composite boat which was manufactured at Knight & Carver and her design plans were devised by Ed Monk Yacht Design. 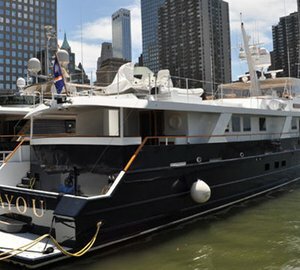 Accommodating 6 passengers and 3 crew, motor yacht DULCINEA was formerly 950. The private superyacht has been created with a naval architect called Ed Monk Yacht Design. Helen Shepardson undertook the interior design. Ed Monk Yacht Design was the naval architect involved in the formal superyacht plans for DULCINEA. Her interior design was conceived by Helen Shepardson. Ed Monk Yacht Design is also associated with the yacht general design work for this boat. In 1988 she was actually launched with celebration in San Diego Ca and post sea trials and finishing touches was thereafter passed on to the yacht owner. Knight & Carver completed their new build motor yacht in the United States. The main hull was constructed with composite. The motor yacht superstructure component is fabricated for the most part using composite. With a width of 7.04 metres or 23.1 ft DULCINEA has reasonable internal space. She had refit maintenance and alteration work carried out by 2004. Installed with twin CATERPILLAR diesel main engines, DULCINEA is able to attain a high speed of 17 knots. Connected to her Caterpillar engine(s) are twin screw propellers. She also has an economical range of 3000 miles whilst motoring at her cruise speed of 14 knots. Her total HP is 1720 HP and her total Kilowatts are 1266. The good sized luxury yacht M/Y DULCINEA is able to accommodate a total of 6 passengers and has 3 qualified crew. Giving the combined power of 1720 HP /1266 KW. DULCINEA features a teak deck. The luxury yacht DULCINEA displayed on this page is merely informational and she is not necessarily available for yacht charter or for sale, nor is she represented or marketed in anyway by CharterWorld. This web page and the superyacht information contained herein is not contractual. All yacht specifications and informations are displayed in good faith but CharterWorld does not warrant or assume any legal liability or responsibility for the current accuracy, completeness, validity, or usefulness of any superyacht information and/or images displayed. All boat information is subject to change without prior notice and may not be current.